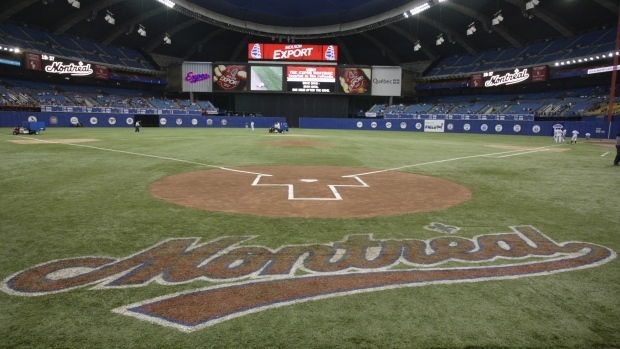 MONTREAL — A group of Montreal investors has met the conditions laid out by Major League Baseball to get a team back in the city, a source has told The Canadian Press. "I can tell you we are no longer looking for investors and that we believe we have all the ingredients to be able to welcome a team, be it an expansion one or one that already exists," the person said on condition of anonymity. The source said the investors have a solid financial set-up, support from two levels of government, various potential locations for a stadium as well as at least five different designs for the venue. "We are not going to say we favour one site or another," the source said. "But it's crucial for the (eventual) site to be well served by public transit." As for what the stadium would look like, the person said there is a lot of flexibility. "We can choose the version we want," the source added. "There are five. They are preliminary plans and we could easily rework them once the project has been launched." The investors are just waiting for a call from MLB commissioner Rob Manfred to get the ball rolling. "For me, the most important element in all this is the team," the person said." All the other areas are sufficiently advanced." Montreal businessmen Stephen Bronfman and Mitch Garber publicly revealed their commitment last year to the project, while Bronfman and Montreal Mayor Denis Coderre co-signed a 2015 letter that was sent to the 30 MLB teams as well as to Manfred. The letter spoke of Montreal's interest in rejoining the major leagues for the first time since 2004, when the Expos left to become the Washington Nationals. Manfred said last year he would like two teams added to MLB in order to make scheduling easier. But he also said that scenario had to wait until another collective bargaining agreement was signed with the players' union and the issue of stadiums in Oakland and Tampa was settled. While the new bargaining agreement was inked last December, the situation with the Tampa Bay Rays and the Oakland Athletics is far from clear. Stuart Sternberg, the majority owner of the Rays, said last week he had to forgo his two preferred sites for a new stadium because they were not available. The search for a new location won't be complete until the end of the year. In Oakland, the NFL's Raiders have announced they will eventually say goodbye to the Oakland-Alameda County Coliseum, where the Athletics also play. The A's have committed to staying in Oakland providing they get a new stadium.